The materials gathered here were originally assembled for use on an intensive Latin course organised in June 2013 by Fr. Louis Ha at the Visial Arts Centre, Hong Kong, but have subsequently been amended and slightly expanded. I am grateful to Fr. Ha and staff at the Catholic Studies Centre, Chinese university of Hong Kong for their assistance and also to Massimo Scorsone and to `Irisatus' and `Gulielmus' of the Grex Latine Loquentium for help in assembling materials. Corrections have kindly been provided by ` Agricola' (also of the GLL), Don Gasper and Olivier Rimbault and I would appreciate anyone finding other errors letting me know here. A good survey of this whole field, and of the growing interest in East Asia in Western classical studies, is provided in a 2016 paper by Harvard University's Kathleen Coleman, which is available here. 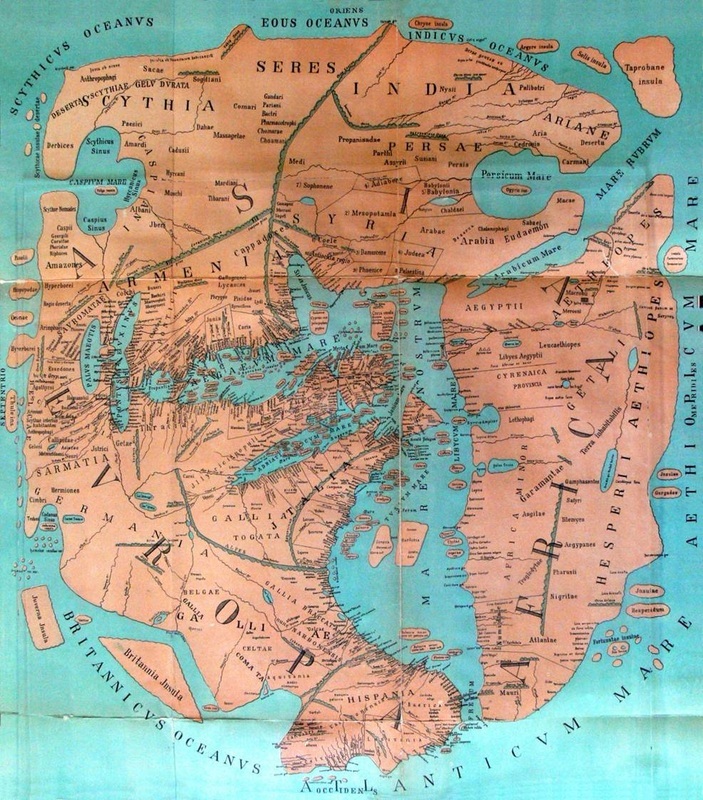 Eurasasia as probably pictured by Roman writer Pomponius Mela (? fl. 43 A.D.). East is at the top and the `Seres' (literally `the silk people') are the Chinese. A major resource not yet covered here but available on the web is the account of China in Book 6 of Giovanni Maffei (Ioannes Maffeius)'s Historiarum Indicarum Libri XVI, published in 1588. The author was an Italian Jesuit commissioned to write a history of lands visited by Portuguese explorers. The work has been translated into French but there has been no English translation or modern Latin edition but an annotated text of the opening page has now been placed on Linguae . Classicists at Dickinson College in the USA are organising a workshop on Maffeius for Latin teachers in summer 2018 and Chris Francese hopes eventually to bring out an edition of Book 6 in collaboration with a Chinese scholar. Other important authors from whom extracts are still to be added are ﻿Iohannes de Plano Carpini﻿ and Willliam de Rubruquis, friars who travelled to the Mongol court in the middle of the 13th century (see the SINA LATINA Powerpoint). The Latin text and English translation found at the link just given for Carpini is from Haklyut's collection of travel narratives and appears to be a more autobiographical account of his mission, perhaps related to C. de Bridia's variant version, which is possibly based on lectures by Carpini (see the Wikipedia article on Ystoria Mongolorum) Carpini's own text of Ystoria Mongolorum, which is mainly a descriptive account on the Mongol Empire, is available on Zurich University; s `Corpus Corporum' pages. Also to be added to sina_latina_trans.doc is Francis Pipino, who produced a Latin version of Marco Polo's memoirs, censoring out some of the racier detail but also probably recording the transcription of some place names more accurately. Pipino's text does not appear yet to have been put on line but a preview of an English translation is available on Amazon . The second word document includes key extracts from David Morgan's article followed by a separate translation of these instead of the interlinear glossing use in the first document. This was prepared as a handout for a Circulus Latinus meeting in August 2013. A major but under-used aid to the history of the Chinese rites controversy, which came to a head in the early 18th century, is the German Jesuit Killian Stumpf's Acta Pekinensia, focussing principally on the 1705-171o mission of papal legate Charles Maillard de Tournon to the emperor Kangxi. This document, written in Latin with material in Chinese and modern western languages interspersed, is preserved in the Jesuit archives in Rome but has never been published in full. An annotated English translation is now being prepared for the Macao Ricci Institute and an introduction to the document is provided by the director of the translation project, Paul Rule, in the pdf below. Recent research has suggested that large stretches of the Silk Road itself may have originated in routes traversed by pastoralists in search of summer grazing for their animals. See the summary of the work by anthropologist Michael Frachetti and colleagues on the Washington University site. A Spanish-language article, Myth and Reality in the Descriptions of the Roman Empire in Chinese Sources, covers the period from 206 B.C. to 907 A.D.
André Bueno's `Roman Views of the Chinese in Antiquity' (Sino-Platonic Papers, n.261, May 2016) presents an extensive survey of the sources, concluding that the Romans, whilst regarding the Chinese as `barbarians' and also getting many of the facts wrong, regarded Chinese civilisation with respect and did not see it as a threat. His many quotations include one from the 2nd. century Greek writer Lucan, who suggested that the Chinese lived up to 300 years and possibly subsisted on water alone! There is a survey of the evidence for early contacts between China and the outside world in Francis Allard's “Globalization at the Crossroads. The Case of Southeast China during the Pre- and Early Imperial Period” (in The Routledge Handbook of Archaeology and Globalization, 2016). Raoul McLaughlin has reserached extensively on the Eastern trade contacts of the Roman Empire and has a video on YouTube outlining the Han Empire's knowledge or Rome in the 1st century A.D.and the abortive mission of Gan Ying (甘英) in 97 A.D., which is also highlighted in the SINA LATINA Powerpoint available from this page. based on his 2006 Ph. D dissertation, includes a thorough survey of the ancient primary sources and of scholarly work on this topic. The book may now be difficult to obtain but he has recently published The Roman Empire and the Silk Routes: The Ancient World Economy and the Empires of Parthia, Central Asia and Han China (2016) and he covers South Asia in his 2014 volume, The Roman Empire and the Indian Ocean: Rome’s Dealings with the Ancient Kingdoms of India, Africa and Arabia (2014). His work is certainly an important contribution, though the claim that Rome obtained one third of its revenue from taxing trade with the East has been challenged. The theory that Roman legionaries cptured by the Parthians in 53 B.C. ended up in Gansu and founded the village of Liquian, mentioned in the SINA LATINA PowerPoint at the top of this page, is discussed with healthy scepticism in the History Channel documentary `Rome- the Lost City of China.' For further scepticism, see also Paddy Lambert's essay on the Heritage Daily site.